With China's water resources shortages, water pollution and ecological deterioration growing more and more prominent, these problems have become a bottleneck restricting economic and social development. In order to assist listed companies, investors and regulators in identifying water-related risks, IPE developed the Corporate Water Risk Assessment Tool (CWRAT) and analyzed its implementation. The construction of a green credit system is necessary for banks to effectively prevent environmental responsibility-related credit risks. However, establishing the green credit system in collaboration with the banking industry has traditionally faced major challenges due to limitations in the previous approaches to sharing information. Based on the Blue Map database, IPE has developed an enterprise environmental performance inquiry platform for the banking industry and is actively cooperating with financial institutions to implement it. In the beginning of 2015, the Securities Times CSR Research Center and IPE launched the publicly-listed A-share company online pollutant data index project, tracking information for 1365 key monitored enterprises of 519 publicly-listed companies. In 2015, the "Environmental Index" was published 49 times. A total of 141 publicly-listed companies and their affiliates were placed on the index, of which 28 enterprises responded to being indexed. Most of the companies that responded have already achieved emissions compliance. On December 9, 2014, the Institute of Public and Environmental Affairs, Lvse Jiangnan and Green Hunan jointly released the Green Stocks Phase II Report. The report points out that a range of listed companies in the heavy and chemical industries are in repeated violation of discharge standards and so have become a serious source of risk because of their potential to contribute to smog problems. The report also calls on investors to take note of the investment risk of listed companies in industries that are responsible for smog problems. In order to understand the environmental non-compliance issues in wastewater treatment industry, an analysis was conducted using IPE's Pollution Database database and shows that over 3600 wastewater treatment plants (WWTPs) in China have 4961 environmental violation records over a period of 6 years from 2008-2013. On average, each sewage treatment plant has 1.4 violation records. To our disappointment, most of the listed companies in the water industry failed to give a positive response to the pollution allegations. 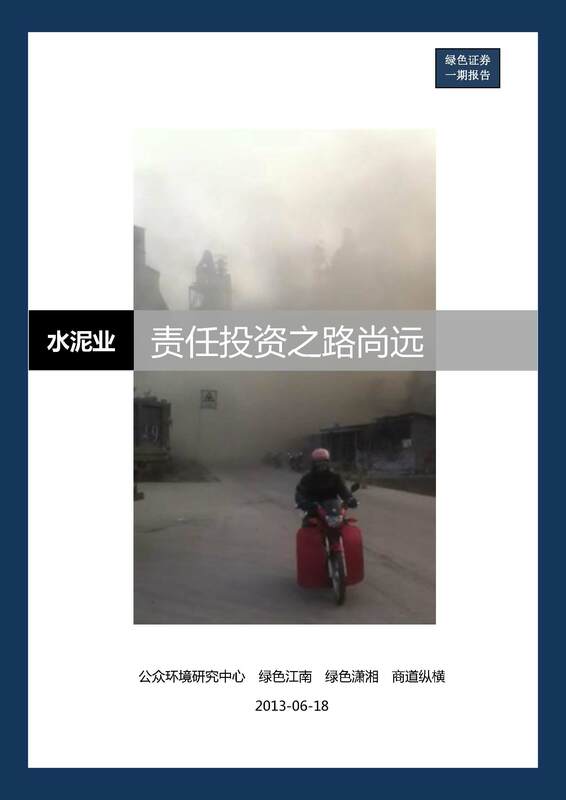 On June 18th, 2013, the Institute of Public and Environmental Affairs (IPE), together with Lvse Jiangnan, Green Hunan and SynTao Co., Ltd. jointly released the Phase I Green Stocks Investigative Report. The report points out that 17 listed cement companies are in frequent violation of regulations on the discharge of gaseous pollutants and they are also not fulfilling their responsibilities to disclose discharge information. On March 1st, 2010, IPE identified 175 companies listed on the Hong Kong Exchanges & Clearing Limited (HKEx) with environmental infraction records in the Chinese mainland.